Across the four theme parks and two water parks, there are 26 attractions in total at the Walt Disney World Resort that require guests to meet a minimum height requirement. Oddly enough, the Tomorrowland Speedway has the tallest and shortest height requirement of any attraction at Walt Disney World. What do I mean by that? 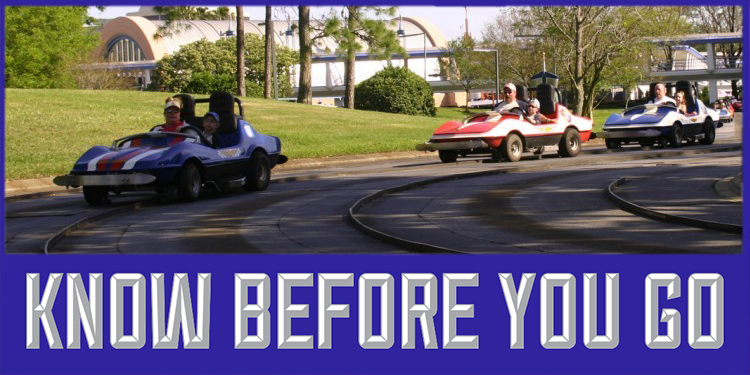 Guests driving alone require the tallest height requirement on-property, as they must be at least 54-inches-tall. If they are accompanied by someone who is 54-inches-tall, the guest only has to be 32-inches-tall to ride, which is the shortest on Disney property. That still doesn’t answer the question of how tall a guest must be to ride every attraction. Technically, guests can still ride the Tomorrowland Speedway even if they haven’t reached 54 inches, as long as they are accompanied by someone that is. So, the tallest a guest must be to ride every single attraction is 48 inches, which is the height restriction for several attractions including Rock ‘n’ Roller Coaster, Primeval Whirl, Summit Plummet, and Humunga Kowabunga. Of course, there are also several attractions at all four theme parks and the two water parks that have no height requirements. If you have someone in your party that falls between 32-inches and 54-inches, I highly encourage that you check out our height requirement calculator, which can be found by clicking HERE!